“Whatever was disappearing had already disappeared, and no one saw it go. This country. This experiment. This hubris. A hurricane force gale cycle of illusion, delusion and half-forgotten truth sweeps over the Westins of Oklahoma, a large dysfunctional family depicted in Tracy Letts’ August: Osage County. It envelops the audience and blows out the venue doors into the heavy night, permeating every nook and cranny of American cultural myth, where it dissipates unnoticed. All are too busy to pay attention; no one sees it go…. Once gone, a huge gaping hole opens up, a well of sorrow, in the hearts of every character in the play. From drunken, pill-popping Greatest Generation elders to agitated, delusional Baby Boomers, from a stimulant-stoked teen living vicariously through drugs, nicotine and electronics to an indigenous subsistence worker who sticks with a most unpleasant job because she “needs the work”, all play a vital part in August: Osage County’s epic tragi-comedy, a tightly wound depiction of modern life’s delusion and unraveling. This play won both Pulitzer and Tony awards in 2008, along with the Drama Desk Award for Best New Play, Drama League Award for Distinguished Production of a Play, New York Drama Critics’ Circle Award for Best Play and the Outer Critics Circle Award for Outstanding New Broadway Play. I sometimes view plays several times before I write my review, a benefit of being an on-line review blogger. I saw August: Osage County twice. Would it be a “potboiler soap opera” as some critics have described it, featuring a host of mostly well-acted but unpleasant characters, punctuated occasionally with one-line zingers for comic relief, or would it be the new Great American Stage Epic, as other voices have pronounced it? In the final analysis, I concluded I had observed a profoundly moving, evenly balanced production full of human pathos, drama and humor, worthy of honor. I felt drawn in by the prologue. I grasped the booze-soaked reality of the long-suffering poet and family patriarch Beverly as he hired a local Indian girl to keep house for him and his pill-popping wife Violet. An embittered but dignified realist, one of the few in the script, Beverly minced no words with his new hire. He slurred resignedly, almost to himself, “My wife is cold-blooded and not just in the metaphorical sense.” Quoting T. S. Eliot in practiced, professorial, dulcet tones or cackling in self-deprecation, stage and television actor Jon DeVries created a memorable portrait of a man ready to set down life’s burdens on his own terms. His own terms. I carried the chilling image of this brief prologue scene with me throughout the three acts, which speaks very well for both playwright Letts and director Anna D. Shapiro, as well as for Mr. DeVries. I appreciated the performances given by the distinguished ensemble. Jeff Still as eldest daughter Barbara’s soon to be divorced husband Bill portrayed a real human being with ease, simplicity and effective stage presence. No caricature, no stereotyped mugging, just a straying middle aged man, struggling to maintain decency and sanity in the midst of dysfunction. He made his character interesting and sympathetic (also played the role on Broadway). Accomplished stage and screen actor Laurance Lau created a fully developed, intriguing character in the show as Steve, the lecherous, smarmy fiancé of the family’s youngest daughter Karen. The play came alive with energy and focus every time he entered a scene. His betrayal and amorality reinforce the tragedy of self-delusion that characterizes his fiancée Karen (Amy Warren), as well all the women in the family. And there it is. The women in this play and the actresses who play them drove the show to its heights and depths. “Dissipation is worse than cataclysm,” acknowledged one sister in a non-agitated, lucid moment. Violet’s sister, three daughters, and the granddaughter all converged on the family home, with husbands and boyfriends in tow, to support her in her loss, grief and illness. Each one slammed hard into a brick wall of illusion and delusion and ultimately drifted away to the safety of each’s world, leaving “cold-blooded” mother Violet to deal with the lonely reality alone. “Who is stronger? When there’s nothing left, I’ll still be here,” snarled Estelle Parsons as matriarch Violet near the play’s end. Elder daughter Barbara (played with steel-willed multi-dimensional sorrow and ferocity by Shannon Cochran in a fascinating yet exhausting portrayal) shrugged back as she began to fade out, “You’re right, mom, you’re the strong one.” She was most like her mother; she tried the hardest to combat the dysfunction. Her stoic exit slammed the door shut with grim finality. Many people have declared August: Osage County on a par with the works of Eugene O’Neill and Arthur Miller. It certainly deals with major themes on a grand scale in an effective, entertaining manner. Yet it remains to be seen where this play and future Tracy Letts plays will fit into the canon of American dramatic literature. Letts, himself, seemed somewhat dazed by the scale of positive response to his play. Chicago Tribune critic Chris Jones in a September 2009 LA Times article writes, ”On the day he heard about the Pulitzer, Letts described himself as “happy, sad.” “My dad,” he said, heavily, “was much more sure of this than me.”” (Letts’ late father, actor and professor Dennis Letts, performed as the play’s patriarch in the original Chicago premiere and continued with the role on Broadway until cancer sidelined him.) Will it be revered and performed frequently in five years, in ten? Although I agree that August: Osage County is a remarkable work, I’m not ready to set it respectfully on the bookshelf next to the works of Miller, O’Neill, Albee, and Shepard. Not yet. The play ends, house darkened and empty, Violet sobbing in lonely despair, crouched on the lap of the Indian housekeeper Johna (DeLanna Studi). Johna strokes her hair and croons, chanting lines from T. S. Eliot’s 1925 poem, The Hollow Men. The play curls full circle back to the prologue, when deceased patriarch Beverly quoted Eliot in drunken defiance and gave Johna the book of poems. Light fades to black…. 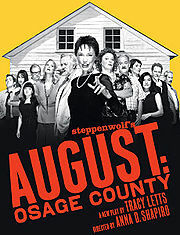 August: Osage County, on national tour, runs through January 24, 2010, as part of the Lexus Broadway series at the AT& T Performing Arts Center in Dallas TX. advertising and *********** with Adwords. Anyway I am including this RSS to my email and can look out for much more of your respective interesting content. Ensure that you replace this once more soon..